Ever wonder why your round bounces off of a lightly armored tank even though it should have went through? I found myself wondering the same thing before I understood how World of Tanks calculates armor. This page will hopefully dispel any questions relating to how armor is calculated, zero damage hits, and all that fun stuff that angers many in World of Tanks. Lets start off with effective armor and how it is calculated. Many players are able to figure out and look into the amount of armor each tank has in specific locations. Many will see that “x” tank has 150mm of armor on the front glacis so therefore if they have a gun that has 160mm-200mm penetration they would be able to damage it. What is not fully explained is that the slope(or angle) of the armor increases the effectiveness of that armor immensely. 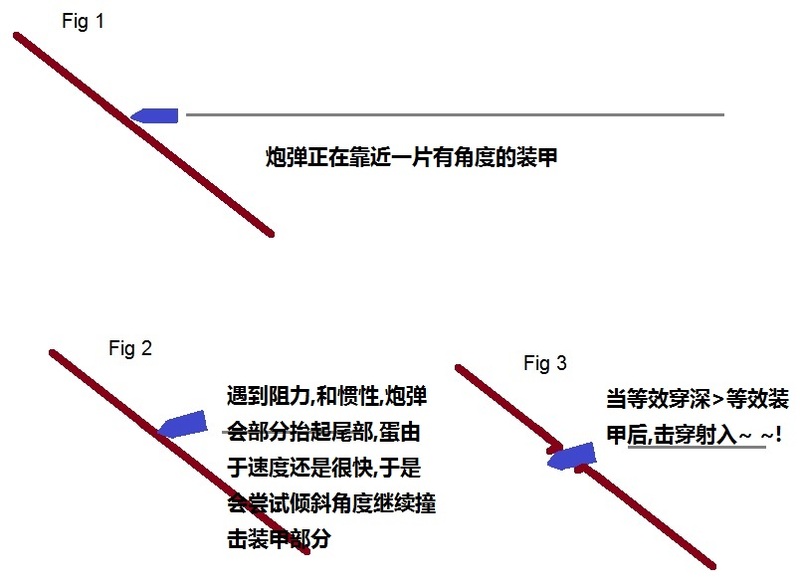 Effective armor refers to the thickness of the armor combined with the angle to figure out how much penetration is actually required to penetrate. Effective armor values are only used against HE, HESH, and HEAT shells as these shells do not “normalize” but more on that later. 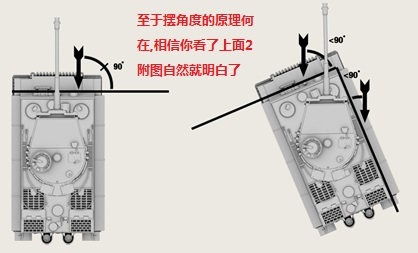 For example… That 150mm armor plate on “x” tank is actually at a 50° angle. To find out the effective armor you need to do a little math. In this situation you would do (150/cos(50°)) which comes out to be 233mm of effective armor. As you can see this is much greater than the 150mm listed value and no wonder why a gun with 160mm-200mm of penetration would struggle going through it with most of it’s shots. A good rule of thumb is that armor at 60° will double it’s effectiveness. Normalization relates to AP, APCR, and APDS shells. Normalization refers to when the shell hits sloped armored and “normalizes” a few degrees to try to stay on it’s initial flight path. In World of Tanks normalization for APCR shells is 2° while AP shells is 5°. 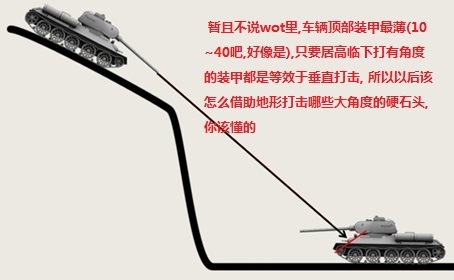 This means that if a AP shell hits that 150mm plate from tank “x” which is at 50° the shell will “normalize” 5° so that it will only need to penetrate 150mm of armor at 45(for APCR simply do 2° instead of 5°). This lowers the armor value that the shell needs to travel through making it easier to penetrate and do damage. For example: The 150mm plate at 50° when hit by an AP shell will actually be at 45° when the armor value is calculated. Therefore, you would end up using (150/cos(45°)) will end up with a armor value of 212mm. This value is much lower than the 233mm effective armor value from before which does not take into account normalization. When it comes to spaced armor a shell will continue to normalize as it penetrates through the spaced armor. As far as compound angles where the armor is angled both horizontally and vertically the shell will only normalize against which ever angle is the highest found at that specific location. To recap on the example earlier.. The 150mm thick armor plate at 50° would have an effective armor value of 233mm. This means that to penetrate with HE/HEAT/HESH the shell fired would need to roll a higher penetration number than 233mm. The same 150mm/50° armor if hit by an AP/APCR/APDS round would “normalize” to 150mm/45° giving it an armor value of 212mm. This means that an AP/APCR/APDS round would only need to roll a penetration value of over 212mm instead of 233mm to penetrate. In update 8.6 for World of Tanks HEAT shells were changed. Before this update HEAT shells would not ricochet or “bounce” off but now they do so at 80°. HEAT shells now also loose 5% of their penetration value for every 10cm travelled after hitting the first layer of armor. This means that spaced armor/tracks on tanks will greatly hinder HEAT rounds. Overall HEAT shells remain a very viable round against non-space armor sections of tanks but hitting any type of spaced armor will usually result in the round being absorbed and negated. Armor which is angled both horizontally and vertically can be difficult to damage and figure out what the actually armor value is. As stated earlier only one of the angles is normalized if it is armored both horizontally and vertically which helps armor like this retain it’s strength. To find the armor values for AP rounds you will use the same formula above, but only subtract the 5° normalization value off of the highest angle. 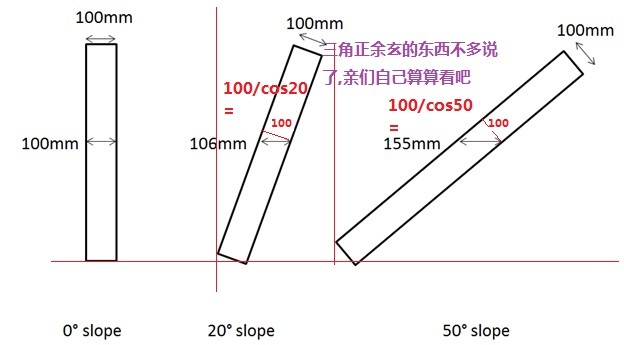 Therefore, if a piece of armor is angled at 45° vertically and 30° horizontally then you will only add the normalization change to the 45° angle since it is the highest. Zero damage hits are a big complaint of many players both new and experienced. In most cases they are easily explained and avoidable since many occur due to spaced armor. Spaced armor is found on all tanks in the form of tracks or the mantlet. These areas have two layers of armor while require a shell to pass through both to do damage. Therefore, when your shell hits an area like this and “penetrates” but fails to do damage it has failed to penetrate the second layer of armor and has only passed through the outer spaced armor layer. Tracks on all tanks add an added layer of armor and should be avoided unless you know your gun’s penetration is high enough or you want to actually track someone. Most tanks under tier 5 add 5-15mm of armor for the tracks. Tier 5 and above see light,medium,and some of the smaller heavy tanks add 20-30mm of armor for the tracks while very large/heavy tanks like the TOG II* and Maus can add up to 40mm of track spaced armor. On other tanks such as the T26E4 Super Pershing and IS-3 there are additional spaced armor plates on the actual hull of the tank or on the turret aside from the mantlet. These areas also produce many zero damage penetrations since the spaced armor is easily penetrated but the armor behind it is much stronger. For players who use the green-yellow-red indicator on the sight while aiming this can be very frustrating as that indicator might show up as green on spaced armor but in reality you’ll be shooting at very tough armor. To combat against spaced armor and zero damage penetrations it is best to do some simple searching for tanks which have spaced armor. Learning where it is and how difficult it is to penetrate is key. It is also important to teach yourself how to aim around the track areas when needed and also avoiding to shoot the mantlet areas on the turret.